To start listing your products on Amazon USA, CA or MX please note that you need to provide some information about the products without failing. If you have added these information to your Shopify store while adding products, ExportFeed app will grab the individual value for each of those attributes and create an error-free listing on Amazon. Let’s check the required attributes for Software and Games category. 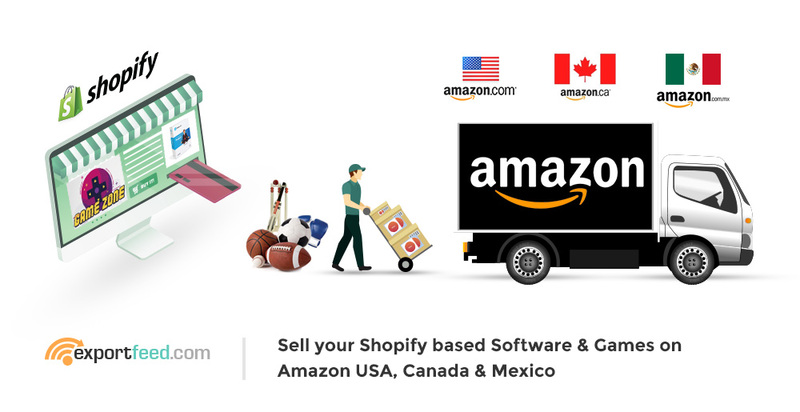 When you are using ExportFeed to list your Shopify based softwares or games on Amazon Canada, this information can be handled automatically by ExportFeed Shopify app. Item SKU is the SKU value of your products as you’ve set it on your Shopify store. After listing your Softwares and Games on Amazon, if you change the SKU and upload them again, they will be listed as a different product. To avoid relisting, either keep the SKU value of your products same or delete the listing from Amazon and relist again. This is the title of your product as you have listed on your Shopify store. While listing your products on Amazon marketplaces, a common convention to follow regarding the product title is: Product name followed by the brand name and the attributes of products. However, as you are already selling through the Shopify store, your product title for Amazon will be same as your listing on Shopify. One contradiction to this would be the case where your Shopify product title exceeds the character limit allowed by Amazon marketplaces. Who manufactured this product? Amazon is trying to get this information from you. We’ve all known about the counterfeit products being sold on Amazon and the policies that Amazon has started implementing to avoid such mischievous activities. As this is a required value but Amazon hasn’t put a restriction by providing the valid values for this attribute, you could map your Brand with the manufacturer. This will help you avoid errors and list your software and toys products on Amazon North American marketplace. By product ID, Amazon requires you to enter some globally identified product identifier number like GTIN, GCID, EAN, UPC, ASIN or such. If your manufacturer has provided you with these values for products, it is a good idea to add them to your Shopify or BigCommerce listing. You could use some custom values app on your platform to add these values to your individual products. If you do not have these values for the products that you are selling, you can either apply for the GTIN exemption if applicable or purchase the UPC codes for your products. The above mentioned product attributes are mostly common for all of the product category type unless you are selling through Amazon handmade or Amazon Vendor central. You will be able to provide up to 7 operating systems when listing your products on Software and Toys category on Amazon marketplaces. Define the hardware type required for the platform. You’ll only be able to provide upto 5 values for this product attribute. Amazon has defined the valid values for this attribute. So, you’ll not be able to create your own hardware platform or requirement. This value is the rating for product provided by Entertainment Software Rating Board. Amazon requires a value for this attribute to understand and segregate the product for promotion as well as improve the user experience for customers. This is the price of your product without any discount or other promotions applied to it. While providing the Standard price for your product make sure that you don’t add any currency identifiers such as USD or $ signs. Amazon doesn’t accept the thousand separators like comma in the standard price also. Amazon requires the quantity of your products in numeric values greater than. In-stock or out-of-stock are not acceptable. If you haven’t managed your stocks in your online shop, ExportFeed will allow you the option to set a default value for the quantity attribute of your products through an easy interface. Make sure that you use popular currency in use in the Amazon marketplace where you are listing your product. If you are listing on Amaozon USA, it is better to USD than to use CAD or similar. Main image URL is the link to the main image that Amazon will display for your product. This URL should be publicly accessible and should point to the image with white background. If you send the image link with 1000 px then the image zoom feature will be activated. Also, keep a note that the images need to be in white background without any promotion texts or such. How ExportFeed helps you grow as seller on Amazon?